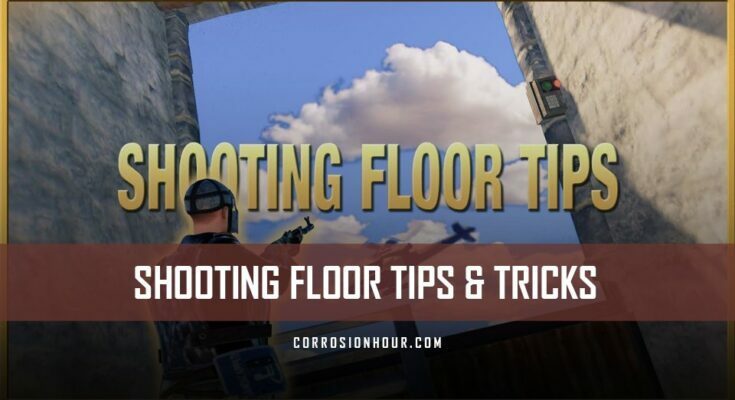 Our partner Everherd is back again with a new video around RUST shooting floor tips and tricks. He walks through some traditional and experimental techniques for setting up and improving your base design’s shooting floors. More often than not, RUST base designs typically have wide open shooting floors or traditional windows with bars or embrasure coverings. These cookie cutter patterns are highly predictable and expose too much of a player’s body during firefights. Open shooting floors are also prone to snipers aiming for sweet spots. Consider using some of these RUST shooting floor tips in your next base design, or modify them and experiment. Some of you might know this. This is a bunker window it’s a lot stronger than a normal shooting floor. And here’s something that Zedge helped me discover. You can see that you’ve got a really nice peak for looking at people and also, we’ve got a door so you can peek people from far away we’ve also got a drop box so you can store your loot. Right here we’ve got a vending machine. It’s not a very good option. It’s more of a concept but it’s got a lot of storage and a really nice peak. And right here is something really convenient that you can do in pretty much every base. So here you can see how to build all of these things. Here’s the shop front trick. You want to place things like this, but you don’t want to upgrade your wall frame. You want to leave it twig, then we want to place a doorway up here then we just break the twig wall frame. If you want to, you can place a drop box for some storage. Now we just add another wall frame as well as a wall up there. You can also add a ceiling. So, this is a little complex, you basically want to place in a door frame. Place in a vending machine inside of it, and then add a garage door going through it, then you also want to place a sign, be careful though if you want to make any edits then you’ll have to close the garage door before doing them. Otherwise the sign will break like this. You could also probably use this as an un-lootable loot room. To build the last thing you basically want to place a garage door and then place a concrete barricade like this and add a normal sign to protect your head. If you enjoyed this little video than make sure to like it, subscribe as well as press the bell icon so you never miss an upload this was Everherd see you guys in the next video bye bye.